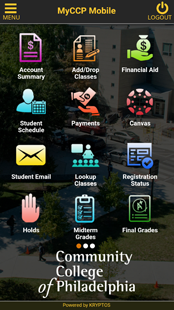 Introducing the MyCCP Mobile app — you can use it to search, register and pay for classes, check financial aid and account balances — and more. Put all of the latest College information at your fingertips for anytime, anywhere convenience. MyCCP Mobile also gives you direct access to academic, event and athletic calendars; Facebook and Twitter; the College Bookstore and more.